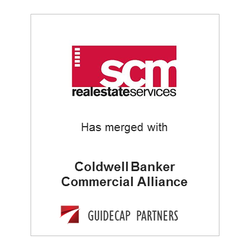 SCM Real Estate Services has merged with Coldwell Banker Commercial Alliance, a national commercial real estate brokerage company headquartered in New York City, dedicated to serving private investors, owners, and small/mid-cap corporate users of real estate. Launched in August of 2012, the firm currently has five offices, 150 professionals, $800 million in closed transaction value and over six million square feet under management. GuideCap Partners served as financial advisor to SCM Real Estate Services.